I thought this building near Lancaster, Pennsylvania, once one of the largest in the colonies, was pretty interesting. 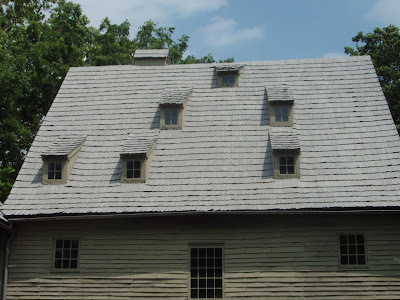 It was the meeting house for a religious minority group founded by Conrad Beissel, now known as the Ephrata cloister. Note how the windows are placed without any pattern or symmetry. This is because Beissel and his followers were expecting the return of Christ at any moment, and they had no expectations that the building would last beyond its immediate use. Measuring windows was too much trouble. The irony, of course, is that the building is still doing fine three centuries later, during which time generations of modern structures have been built and torn down. And the funny little windows are an interesting quirk.